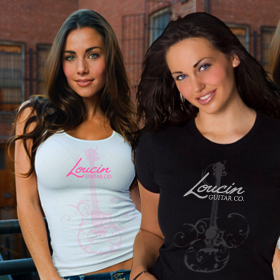 Guitar T shirts, Hats, Jackets and Much More | Loucin Guitar Co.
Get yourself decked out in the latest Loucin T’s,tanks, hats & jackets. 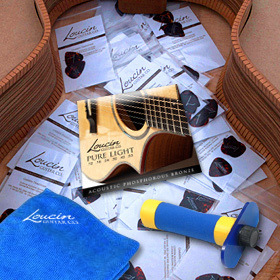 Stock up on our awesome Loucin Pure Light acoustic guitar strings so that your guitar always sounds its absolute best. 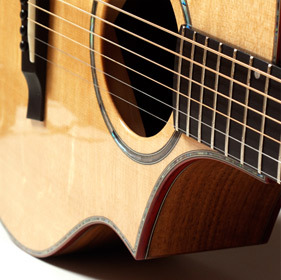 And, if you love our guitars as much as our artists do, you can wrap your computer in our ultra cool wallpaper. We’re always adding new items so make sure to bookmark this page. If there are items you’d like to see, drop us a note. And, if you want to know about new products and special offers before anyone else, sign up for our newsletter and follow us on Facebook and Twitter!